Puntos Necesarios: 2350 Tenga en cuenta que, de momento, no se puede descargar contenido de nuestra plataforma directamente en un dispositivo móvil (teléfono, iPod, iPad, tabletas ...). Necesitas descargar sus artículos en un PC o Mac y, a continuación, transferirlos a su dispositivo de forma normal. Estamos trabajando para permitir que las descargas directas a los dispositivos móviles, pero esto no es posible en la versión actual de la plataforma. Perdón por las molestias! NOTICE: Activation key must be used on a valid Steam account. Requires internet connection. About the gameCircle Empires is a fresh take on the RTS genre, featuring a fast-paced approach to conquering the world. 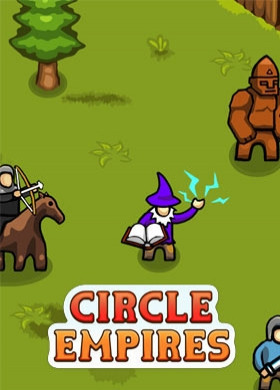 The Circle Empires universe is made of interconnected circles, each containing loot to plunder and foes to defeat. You are the god-like leader of your tiny kingdom, hungry for power… . Use your skills to hunt down increasingly powerful enemies and expand your empire. The game world changes every time you play - no two games are the same. And... you can grow pumpkins!Originally released as a small demo, Circle Empires was avidly played by 160.000+ gamers worldwide.“Since we got all this love from thousands Circle Empires demo players, we decided to make it into a fully-fledged RTS. Now, after two years of work, this little gem is ready to be enjoyed.” – the Luminous Team. Key Features Fast-paced real-time strategic gameplay with large-scale battles Expand your empire, circle by circle Units can gain XP and level up Procedurally generated worlds containing unique flora and fauna 150+ different creatures, buildings and resources 18 Different faction leaders, a variety of bonuses 12 enemy boss monsters A magnificent treasury that grows with each battle System Requirements Windows - Minimum OS: Microsoft Windows 7 SP1, Windows 8, Windows 10 Processor: 1,7GHz dual core Memory: 3 GB RAM Graphics: Intel/AMD Integrated Graphics, 1GB VRAM DirectX: Version 11 Storage: 1 GB available space Additional Notes: System requirements may be subject to change. Windows - Recommended OS: Windows 10 Processor: Intel Core i3 2100 3,1GHz Memory: 4 GB RAM Graphics: NVIDIA GeForce GT 1030 2GB / AMD Radeon HD 6850 2GB Storage: 1 GB available space Additional Notes: System requirements may be subject to change.